Quorum Business Park is a large commercial property development located 4.5 miles north of Newcastle city centre. The park has been built on what was the North Tyneside Enterprise Zone until 2006. The site itself contains over 1 million square feet of commercial space (suitable for both office and retail), and is surrounded by nearly 50 acres of parklands. At the time of writing, there were 16 office buildings at the park, 7 of which were fully let. The remaining buildings offer office accommodation ranging from 500 to 104,000 square feet. Moreover, building Q16 offers office space on a per-desk basis. In 2009 – 2010, a number of large companies began to move in, and to this date park tenants benefit from special incentives and support, such as the North East Investment Fund, North East Access to Finance, and the North East SME Innovation Programme. Quorum has also attracted an international pool of talent, as staff working at the park come from 65 countries. This is an award-winning office development that has received two Business in the Community Awards, the 2011 RICS Award, and the 2013 North East Business Awards in the category of Corporate Responsibility and Environment. Although unit details vary from building to building, occupiers enjoy access to high-end office units and amenities. The park offers 24-hour access to offices, and office units boast first-class standards, since several buildings have an Excellent or Very Good BREAM rating. Offices feature accessible open plan workspaces, comfort heating and cooling system (VRF Air Conditioning), suspended ceilings, raised floors, integrated LED lighting / Category II lighting, an EPC rating of C, fully equipped kitchens, showers, and self-contained bathrooms. Other on-site amenities available to Quorum employees include car parking space, covered bike parking, free pool bikes, access to the Quorum Sports Club (which consists of a fitness station, 3 tennis courts, a football pitch, and a netball court), a gym that’s available 24/7, a dedicated area in building Q11 offering meeting and games rooms, a nursery, several cafes and street vendors, and round-the-clock security and maintenance. Quorum Business Park is served by Arriva buses that link the park with Newcastle and other towns in the surrounding area. The most useful bus lines include bus 52 (Cramlington to Newcastle), bus 54 (Whitley Bay to Newcastle), buses X10 and X11 (Newcastle to Blyth), and bus 555, a shuttle that starts at Four Lane Ends station and terminates at Quorum Business Park. In addition, Benton Metro station (Yellow Line) is 1.4 miles to the south. Road access to the park is also convenient. 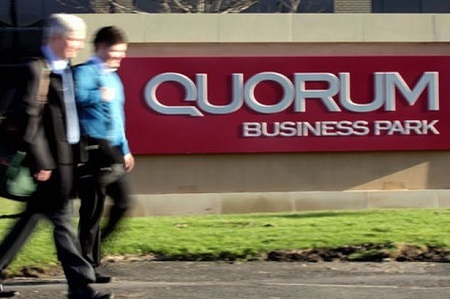 Quorum is 3.5 miles away from the M1 and approximately the same distance from the A19. In normal traffic conditions, it only takes 8 – 12 minutes to reach the park from either of these two roads. The nearest airport is Newcastle International, situated only a 15-minute drive via the A696. Quorum occupiers feature a mix of local, national, and multinational firms. Some of them are private sector businesses, but there are also public sector organisations and government departments based here. Additional office space opportunities in the Newcastle area.